MASABI: Post Holiday Fun - Very Random Thoughts! Post Holiday Fun - Very Random Thoughts! The holidays are wrapping up, yet I find that I am still lingering on themes of gingerbread men, tales of candy houses, and New Year's fireworks. So perhaps my elderly clients won't mind extending the season a bit....as I write this, it is January 10 and I still have my tree up! My only grandchild so far, a five year old little doll, was in CA for the holidays with her parents. Since my tree is a culmination of homemade and memory ornaments, I kept it up so she can find the newest one - a beautiful Ariel, her favorite Disney princess. I will see her tomorrow. So I indeed embrace the holidays a bit more and go by the store to purchase four gingerbread making houses at a very good 75% off the original and head on over to the houses where I work. The first group is very enthusiastic - two men and two women in varying stages of dementia, yet they are quite verbal and anxious to have their attention diverted. All were happy to place the candies on the very sticky icing. G laughed and said he had never made one of these and thought it was quite fun. Added he was too busy to do fun things when he was young. 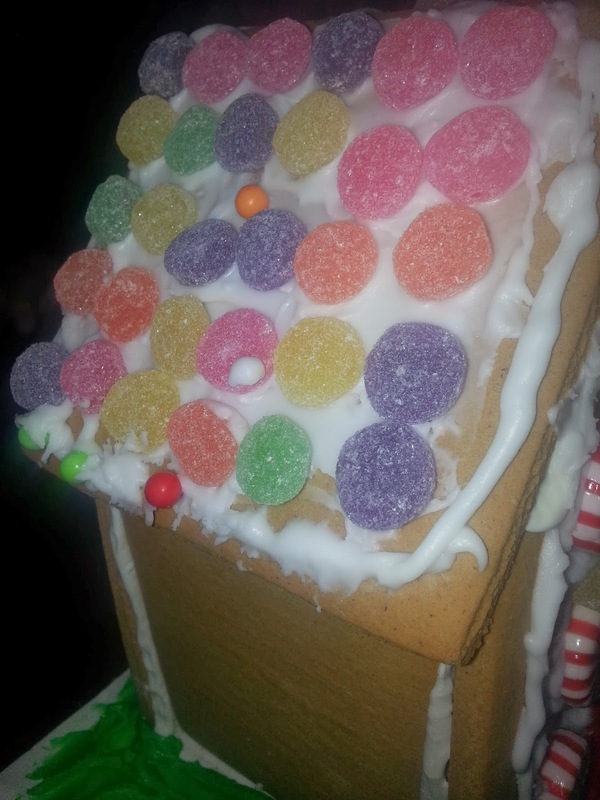 He was methodical as he placed the candies in a straight row on one side of the roof. 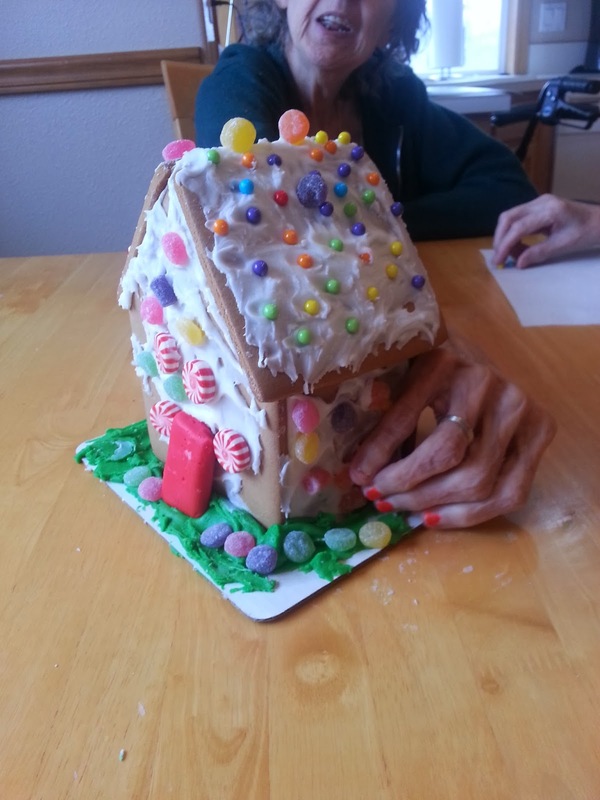 A sweet and often confused lady decided they might go better IN her mouth than on the house. I gently reminded her that they should go on the house, but I did bring them all some sugar-free vanilla and some sugar-free mocha cookies, which satisfied her need to munch. As they each worked on the house, you could hear small whispers of Oh how beautiful! So sweet! How fun this is! And lots and lots of smiles. 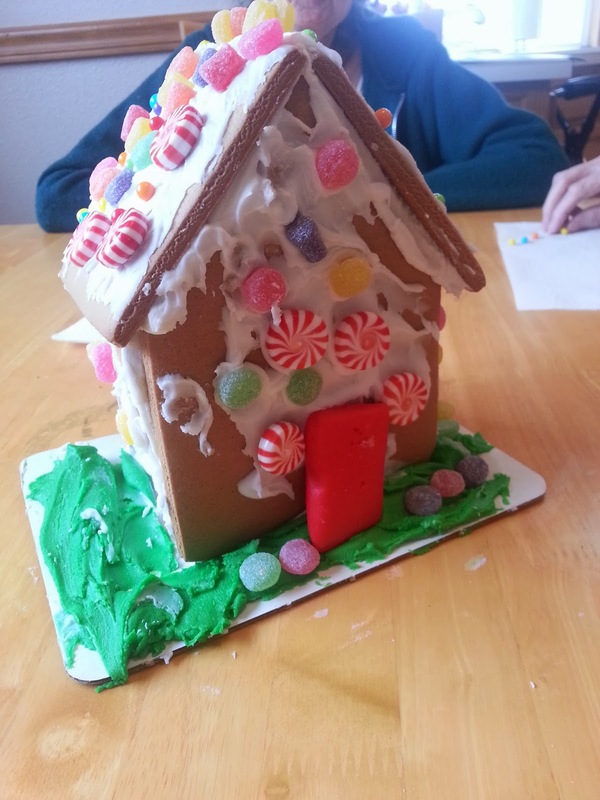 After we decorated the house, we talked about gingerbread. Did they ever make it at home or did their mothers? Lots of smiles and we watched a small Youtube clip of the Gingerbread Man and sang the refrain Run, run, run, as fast as I can - I am the Gingerbread Man! 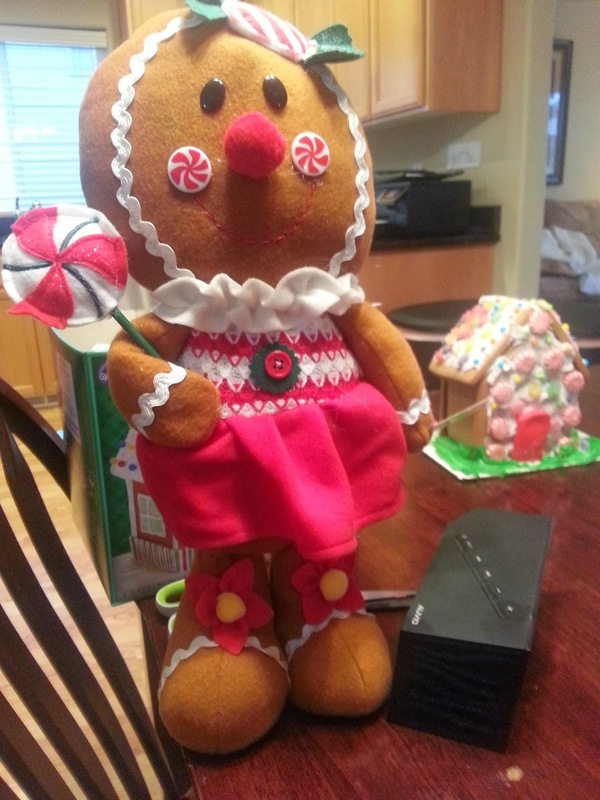 I shared with them my newest post holiday purchase - the Gingerbread Girl. They laughed and some wanted to hug her. She was naughty when we sang and ran all over the table, much to the delight of the oldsters. I really worry about infantilizing art for these precious individuals, but I who am only 10 - 15 years younger than they, explain that I did not do a lot of these things as a child, so I enjoy them now. That hits the spot as some of them add, I've never done this before. Who knows? Maybe they haven't. 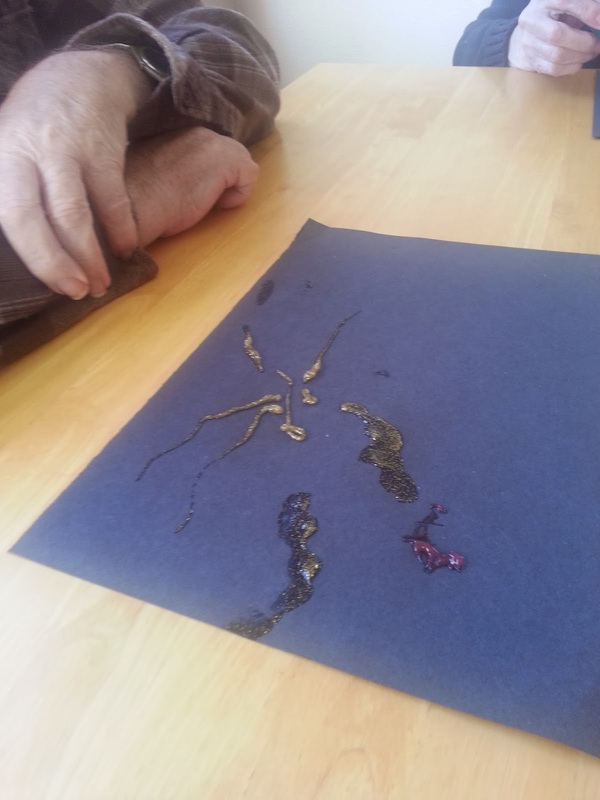 After tasting, laughing, and creating, we decided to move a bit and to lubricate our joints. This is the time I have to push a bit for them to open up - I turn on the music and begin to move, gently urging them to do the same. I'm tired. It is the refrain of J who always says he is tired. I remind him that just as a car needs to be used or it will rust away, so will he. He tries for about five seconds and that is it. I wonder if he will ever move a bit more. B just smiles and say boyz. Boyz. 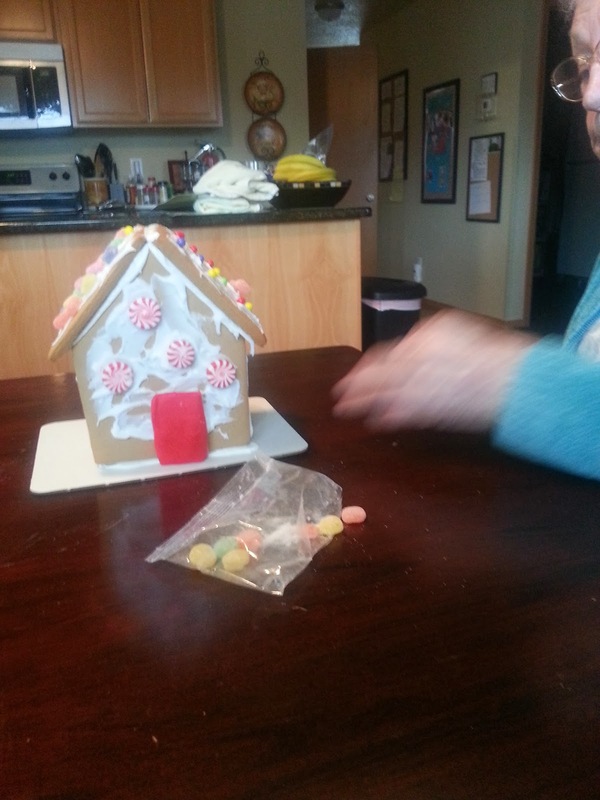 She smiles and when I ask her if she enjoyed putting the candies on the house, she surprises me and shakes her head yes. The women are constantly trying to wipe down the table and I realize that is part of their past. My own step-grandmother was in severe decline when she could no longer speak, but would try to dust anytime she passed by a piece of furniture. Even though I would assess that today was a positive experience for my clients, I worry and fret weekly about what we will do. 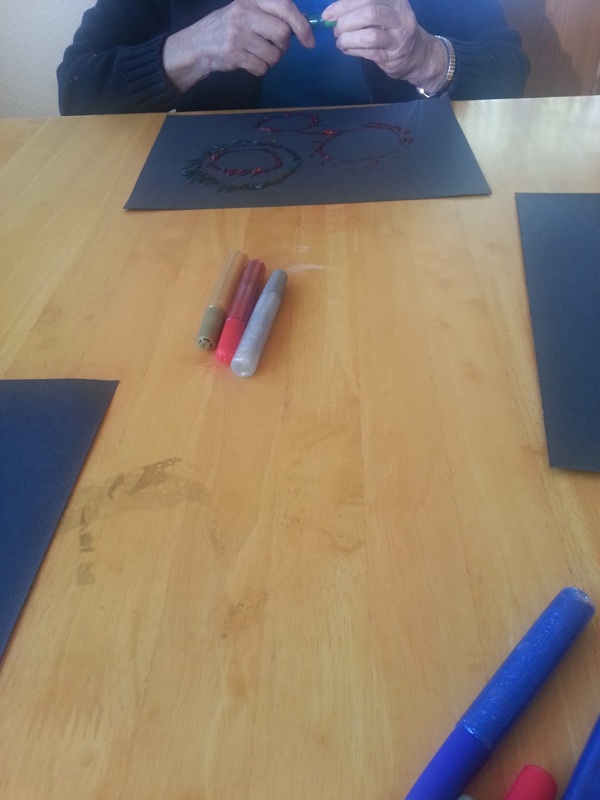 If I give them a pen or pencil, they don't know what to do, so I must have something in mind...we might even add some percussion instruments to our workout next week. My thought process is disjointed and random as I reflect over today's sessions. You gotta squeeze and it will come out. It will dry hard. They seem interested in doing it. Some are more successful than others, but they all are curious and try it once.